Meet Your Hygienist – After being greeted by the friendly staff at the front desk, the next person you’ll meet will be your dental hygienist. He or she will go over your medical history with you and make sure there are no new problems or medications that the dentist should be aware of. You’ll also be able to ask any questions you may have or discuss any changes in your oral health. The Cleaning – The next step will be the cleaning. Your hygienist will clear away any harmful plaque and tartar that cling to the teeth and can cause decay. This will leave you with a clean mouth and teeth. Your Examination – Following the cleaning, you’ll have two examinations done – one by your hygienist and the other by your dentist, each checking for different things. While the dental hygienist will be on the search for signs of tooth decay and any other problems with the current state of your teeth, your dentist will examine you for signs of oral cancer, jaw alignment issues and other more complex issues. X-Rays – Additionally, X-Rays will be taken to provide your dentist with visual images of parts of your oral cavity that would otherwise be impossible to see. This plays a major role in providing a baseline that can be referred to in the future, which is also integral in detecting developing issues and diagnosing them with more accuracy. Initiating your first visit is very simple. All it takes to get started is to reach out to your local dentist to set-up the first appointment. Once scheduled, be sure to show up about 15 minutes early for your first visit so you can fill out any paperwork and enjoy a seamless process. 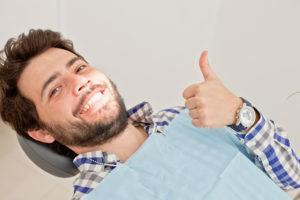 Your proactive efforts will contribute to you enjoying excellent oral health for years to come! Dr. Sarah Esparza earned her dental degree from the University of Maryland Dental School and then went on to serve her country as a general dentist for seven years as a member of the US Air Force. She would later go on to open her private practice, where she has since provided quality and compassionate care. Dr. Esparza practices at Esparza Family Dentistry where she empowers patients through preventive care. She can be reached for more information through her website.